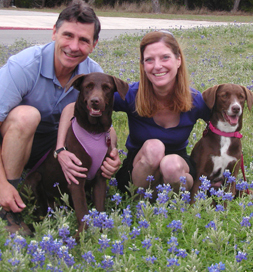 After several years at Kim Acres Animal Sanctuary in Von Ormy, TX, Precious, a Labrador Retriever, was going to a forever home. She’d been at the sanctuary since she was five months old, sent there by the staff at an animal shelter who deemed her unlikely to be adopted because of her extreme shyness. A volunteer at the shelter, Julann Michelini of San Antonio, couldn’t take on another pet at that time, but she felt sad to see the dog go. Read the entire story about finding Precious in Julann’s words. Several years later, one of Julann’s dogs died. She remembered Precious and called the sanctuary. Precious was still there, so she applied to adopt her. Sounds like a happy ending, but the story has another chapter. Soon after adopting the dog, Julann left the house to take a walk with Precious. Something scared the now 70-lb. dog, and she bolted. In an instant, Julann was face down on the ground, and Precious was gone. The family began to receive leads from strangers. She was sighted in a park, in an apartment complex and by a gas station. “People went out of their way to help,” Juleann says. A neighbor reported a dog howling in his backyard at night. “He had a motion-activated web cam, and sure enough, Preshy was sleeping in his backyard but leaving at about 4 a.m. With high hopes, we set the trap, put out food, water, and her cushion, and prayed,” Julann says. But Precious didn’t reappear. On Day 19 of the search, the Michelinis got a call from Kim, who had come from the sanctuary to help. “I’ve got her,” she said. It was what they’d been waiting to hear. Amazingly, Precious was nearby. “She just couldn’t figure out on her own how to get across a fence line from the green belt to the house,” Julann says. Today Precious has settled into her home, and her fears have dissipated. She’s still shy, but the family is working on that. “The moral of the story to us is to never give up hope, keep trying, and never, ever underestimate how wonderful people can be when you need help,” Julann says.